Basil plants grown in the home garden are often used in foods and cosmetics for their pleasing flavor and scent. Successful growth of basil means keeping your plants vigorous and avoiding disease. Susceptible to a variety of fungus problems, your basil plants are open to destruction if fungal infection attacks. Identify fungal problems so you know what to look for and how to keep your plants healthy. Vigorous plants are less vulnerable to fungal infections that weaken plants. For healthy growth, provide your plants with appropriate care. Basil plants thrive in full sun with a minimum need for at least six hours of sun exposure a day. Grow basil in soil that is slightly acid--with a pH of 6.0 to 6.5--well-drained and high in organic content, according to the Clemson University Extension. A warm-season plant, basil needs warmer temperatures with nights that remain above 50 degrees Fahrenheit. Fusarium wilt is a disease of basil plants caused by a fungus. Inhabiting surrounding soil, the fungus Fusarium oxysporum f. sp. basilicum affects the plant tissue of the basil stem which transports water to different areas of the plant. Symptoms include browning, stunted growth and plant wilt, since the basil plant's parts can no longer receive adequate water. The fungus lives in the soil for years at a time; plant resistant cultivars like 'Nufar' as a preventive measure, advises the Clemson University Extension. A fungus problem that causes rotting of the basil plant, referred to as root rot, is caused by fungi from Rhizoctonia species as well as the Phythium species. These fungi thrive in wet conditions and attack the roots of basil plants. Symptoms include branch dieback, yellowing of plant parts and brown areas on roots. Eventually, the roots will completely change to a brown color and die from decay, according to the Clemson University Extension. Spots on leaves appear due to a fungus called Cercospora. Leaf spot disease attacks the foliage of basil plants; typically leaves with high moisture content are most vulnerable to attack since fungi need wet environments to thrive. Additionally, warmer temperatures in the range of 68 to 95 degrees Fahrenheit create an ideal environment for Cercospora. Symptoms include brown spots on leaf surfaces that may display a lighter center with dark edges. For management of fungus problems on basil plants, act on a case by case basis. For wilt, remove and destroy affected plants; plant a resistant variety in its place as soil-borne fungi will re-infect susceptible varieties. For root rot, amend problematic soil with the addition of compost for better drainage and consider the addition of a layer of mulch on surrounding soil for water retention. Remove diseased plants and their surrounding soil, says the Clemson University Extension. For leaf spot fungus, remove and destroy affected plant parts. 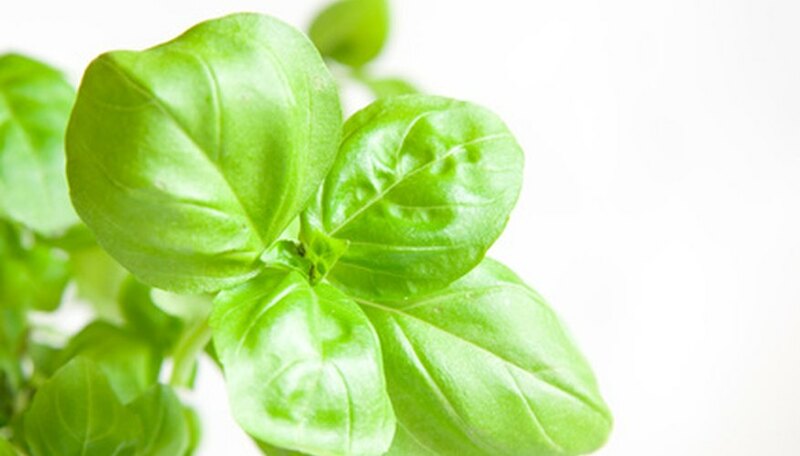 Spray your basil once a week with a fungicide including the active ingredient potassium bicarbonate. Avoid overhead watering and try to expose basil plants to morning sunshine that will dry dew from plants; reduce the excess moisture fungi need for proliferation.